Well our Summer Weather has returned, mid 80’s and humid! But we did have a real nice streak of fantastic weather. Got out and stopped by some friends house for most of the day and then returned home to work on some computer problems I’m still having. I wish I knew more on working with and on computers. 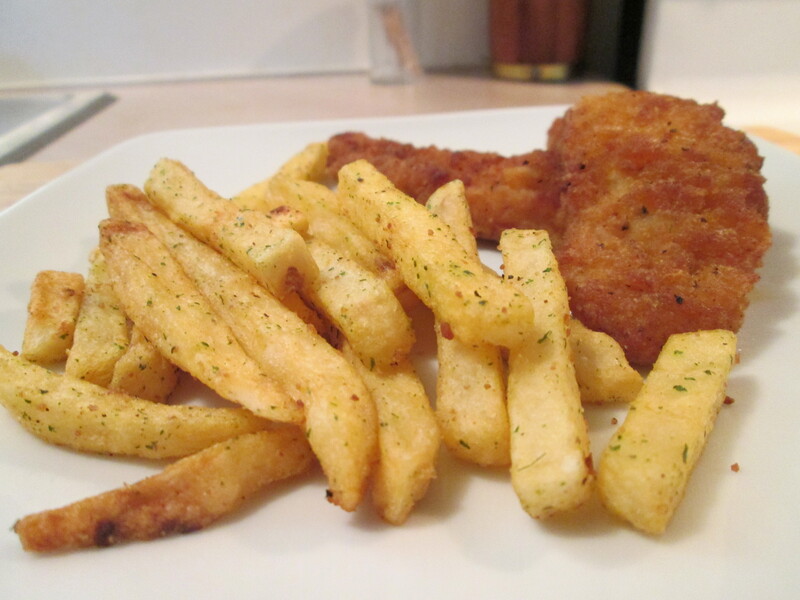 For dinner tonight Weight Watchers Smart Ones Smart Creations Fish & Chips. I originally was going to have Panko Crusted Calamari w/ Brown and Wild Rice. I had prepped them and fried the first batch. Let it cool a bit and sampled it, and that’s as far as that got. Calamari is just not for me. So it was a last minute switch in menu, saved by Weight Watchers Smart Ones Smart Creations Fish & Chips. First time I had tried this one and it sure saved the day! The Fish was very good, good seasoning and breading. The Chips or Fries were very good also, I love any Fry! The dinner was only 310 calories and 34 net carbs per serving, and the serving size were just enough. Frozen dinners do come in handy! For dessert later a Jello Sugar Free Dark Chocolate Mousse. Weight Watchers Smart Ones is committed to providing smart food choices to support you while managing your weight. That’s why Weight Watchers Smart Ones follows a set of six smart eating principles when creating food for you, like Weight Watchers Smart Ones Smart Creations Fish & Chips. Weight Watchers Smart Ones promises to be there throughout the day with smart breakfasts, snacks, meals and desserts inspired by these principles: 1. Portion control so you can eat the foods you love. 2. Breakfast is crucial, because it starts your day right and helps control hunger. 3. Smart eating includes a variety of foods with protein. 4. Whole grains, fruits and vegetables can keep you fuller, longer. 5. Smart desserts and snacks can help you stay on track. 6. Support and knowledge are critical to making smart food choices. Muggy day out there today, showers on and off and in the 80’s. Finished cleaning the shed today, finally. Took a lot of garbage out to the curb. Got the cart out and helped Mom spray wash the outside of the house siding also today. Life in a wheelchair can be real frustrating at times. Certain things you just can’t do, back when I had both legs I was able to do and help with everything. But all I can do is make the best of it. As my favorite saying says, “The world is what you make of it. If it doesn’t fit you make alterations.” It’s still frustrating at times though. 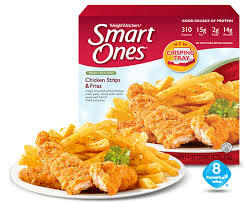 For dinner tonight a new one Weight Watchers Smart Ones Smart Creations Chicken Strips & Fries. While at Meijer the other day I bought a few Smart Ones Frozen Dinners. Meijer has a fantastic selection of these dinners. They’re produced by Weight Watchers with a nice variety of different dinners and desserts. So this one must be one their new dinners, Weight Watchers Smart Ones Smart Creations Chicken Strips & Fries. It heats up in the microwave in their new Crisping Tray, 3 minutes and 15 seconds. They’re 310 calories, 3g fat, and 28 net carbs. Nice size portions, seasoned good, and a good Chicken Strips and Fries meal all for under 400 calories! I did add a bit of Sea Salt to the Chicken and Fries. 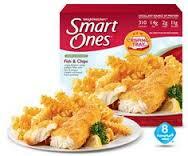 I also purchased a couple of other new Smart Ones Meals, Loaded Potato Soup and Fish and Chips. For dessert later a Weight Watcher’s Triple Chocolate Brownie Bliss, another new favorite of mine! Crispy breaded white chicken meat patty strips with ranch seasoned french fried potatoes. Weight Watchers Smart Ones is committed to providing smart food choices to support you while managing your weight. That’s why Weight Watchers Smart Ones follows a set of six smart eating principles when creating food for you, like Weight Watchers Smart Ones Smart Creations Chicken Strips & Fries. Weight Watchers Smart Ones promises to be there throughout the day with smart breakfasts, snacks, meals and desserts inspired by these principles: 1. Portion control so you can eat the foods you love. 2. Breakfast is crucial, because it starts your day right and helps control hunger. 3. Smart eating includes a variety of foods with protein. 4. Whole grains, fruits and vegetables can keep you fuller, longer. 5. Smart desserts and snacks can help you stay on track. 6. Support and knowledge are critical to making smart food choices. We’ve tried both of these and it’s thumbs up for both! Fantastic Chocolate flavor, satisfy that Chocolate craving with these. They’re only 80 calories and net carbs per Brownie! 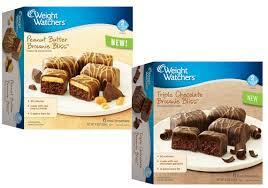 Stay on track with Weight Watchers Snack Cakes, Brownies, and Muffins. These delicious treats are perfect as part of a smart breakfast, an afternoon snack, or an easy, sensible dessert to finish your day. Making smart choices doesn’t mean sacrificing deliciously satisfying treats. A decadent brownie, layered with rich, real chocolate ganache and covered in a chocolaty coating. A indulgent brownie, layered with creamy, real peanut butter and covered in a chocolaty coating.